FACE is currently attending the 36th meeting of the Standing Committee of the Bern Convention, which runs from the 15th to the 18th November 2016. The Convention on the Conservation of European Wildlife and Natural Habitats (or Bern Convention) is the first international agreement dedicated to nature conservation, covering most of Europe and some African countries (50 states in total). Government representatives and organisations meet once a year at the Standing Committee meeting in Strasbourg to talk about environment concerns and to take decisions. This year, the focus is on the outcomes of the 2016 meetings and activities, in particular the issue of conservation of birds, the fight against invasive alien species, the relationship between biodiversity and climate change, and the management of protected areas. 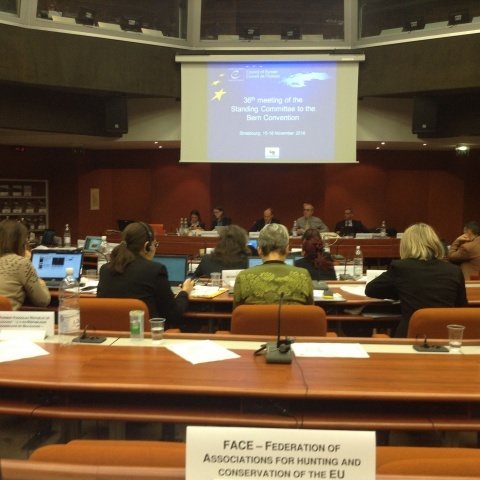 In 2004, FACE, with the European Sustainable Use Group and CIC prepared the European Charter on Hunting and Biodiversity to improve the sustainability of hunting and hunting tourism in Europe. FACE was also involved in developing a Code of Conduct on Hunting and Invasive Alien Species, which sets down 7 Principles that present the activities that hunters and hunting associations should carry out to minimise and prevent the negative influence of IAS. The second Report on implementation of Code of Conduct on Hunting and IAS will be presented by FACE at the next Bern Convention meeting in 2017.